​For more than a thousand years in Britain the force of rivers has been harnessed to drive machinery for grinding corn. 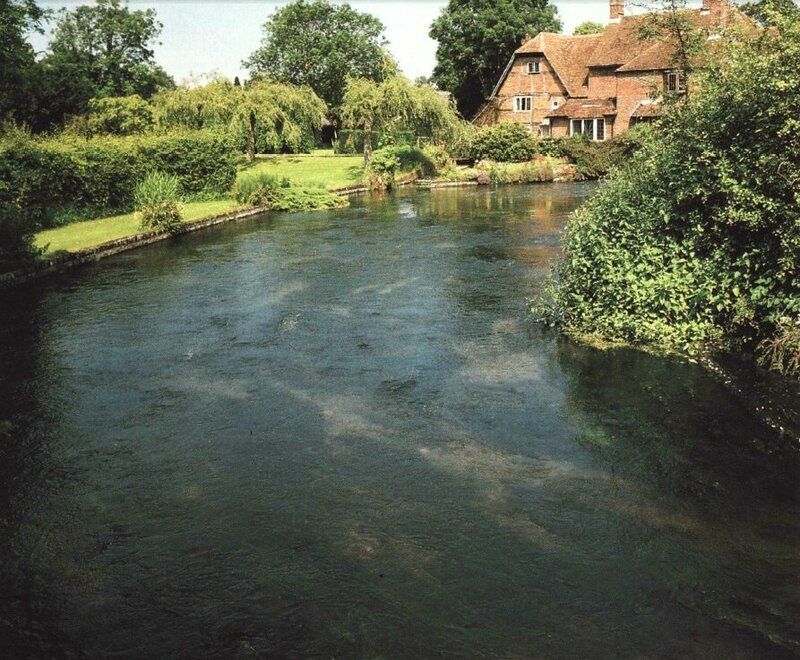 Many water mills were recorded in the 11th century Domesday Book, and their sites often remain today. Few of these buildings are working mills now, although many have been converted into homes. 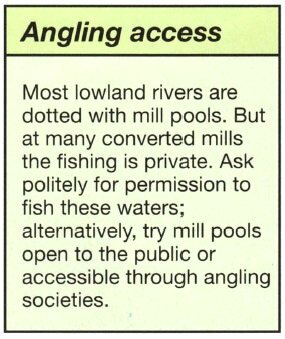 But the water features associated with old mill sites are still fishable and can provide superb sport for anglers. Mills usually channel a river's current to a wheel which turns and powers the grinding machinery. The water emerges at the end of the process into a deep mill pool which shallows out towards the tail. At the head of the pool the water is fairly turbulent; then the flow slows down and about half way along becomes a steady push. The flow of water to the machinery was often regulated by sluices upstream of the mill which directed water into an overflow pool that by-passed the buildings to rejoin the river at the tail of the pool. In the open river fish roam extensively they are continually on the move -while in the mill pools large resident stocks of many species occupy various different niches. 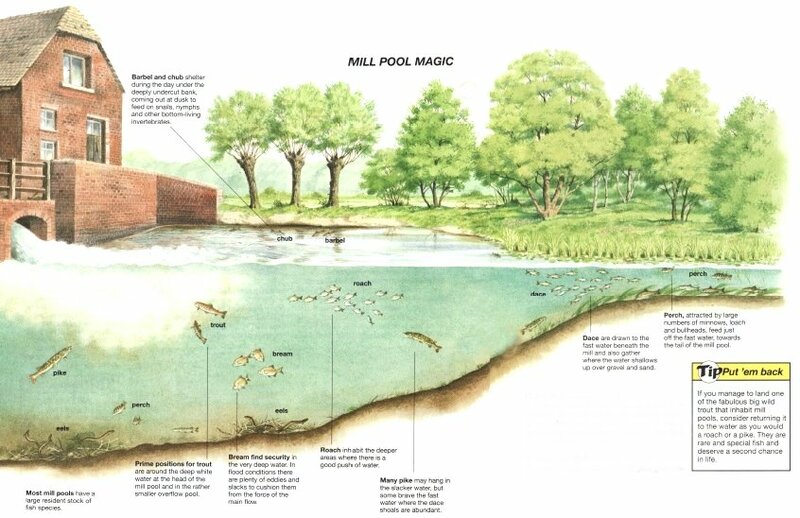 A mill pool is a concentrated cauldron of fish activity. Bream If the river holds bream, some of the largest are almost bound to be present in the mill pool. Generally, the shoal hangs in the deep areas just on the edge of the main drive of water. You don't get large numbers of bream, perhaps between four and a dozen, but individuals can weigh as much as 7-10lb (3.1-4.5kg)- superb fish for a river. A large piece of bread flake on a size 8 or 10 hook, fished over a bed of mashed bread, is probably the best bait for one of these specimens, especially at dusk or in the first hour or two of darkness. The rich food sources of a mill pool guarantee a wide range offish species. Perch Mill pools are the favourite haunts of river perch- they too are attracted by the large head of minnows, gudgeon, loach and bullhead that love the quick water over a gravel bottom. They cruise throughout the pool and the overflow, but their favourite feeding ground appears to be just off the fast water towards the tail of the pool. Here they often chase small fry that skip away from them -you can sometimes see a perch's large spiked dorsal fin cutting the surface in pursuit. Roach are almost bound to be found in the mill pool. Small ones inhabit the edges but mature fish of 2lb (0.3-1.1kg), depending on the river, take to deeper areas where there is a good push of water. There can be as many as 100 roach in such a shoal and the fish rarely leave the food-rich water of the mill pool. In January or February many fish drop downstream as far as the slow, deep water just up-river of the next mill. The largest specimens often congregate there towards the back end of the season when they can be caught in numbers by trotting maggots, casters or pieces of breadflake. Chub and barbel both love the steady push of water towards the tail of the mill pool. The gravel holds a great deal of insect life for them and there is a frequent chance of straying minnows. Along the sides of the mill pool there is often a deeply undercut bank - a feature produced by centuries of strong back eddies eating away at the stones and earth. The barbel and chub use this as a daytime shelter, only venturing out to feed hard through the hours of darkness. 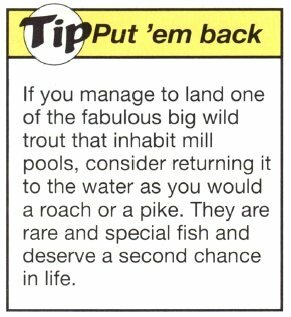 Large and small species alike find what they need in a mill pool. The small fish feast on a rich source of aquatic animal and plant life and the big predators eat the smaller fish. Dace flit around feeding on the various small items in the food-rich mill pool. You can catch dace in numbers on trotted maggot or even on fly tackle. It's hardly surprising this huge head of fish attracts the leading river predator the pike. Jacks of a few pounds find a rich living on the minnows and gudgeon, while for the bigger fish there is a ready supply of roach, dace and small chub. With a bit of luck you might find a very large fish at the confluence of the main river and the overflow stream. Here, where there is an area of slightly slacker water, a big pike often sits with dace shoals playing all around. 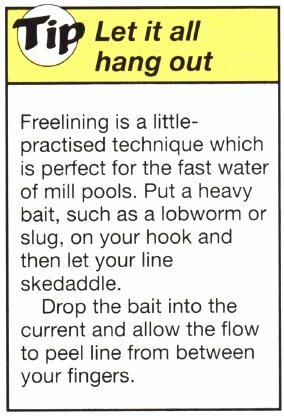 A well-presented bait could just bag that greatest of all prizes - a pike of 20lb (9kg) or more.